Yet again, the God of Redemption transforms my failure into success. Two days ago I worked up a macrame piece and did not start with near enough cord. I was forced to cut the entire piece way shorter than planned and tried making the best of it by fraying the ends, hoping that would help with it’s sad appearance. When I was done, I looked at it and felt really disappointed because I did not like how it turned out. I just hoped someone out in the world would like it and buy it. And then, one of my favorite things happened the next day. A lightning strike of inspiration hit me and I was able to transform an unattractive piece of art into something far more beautiful. 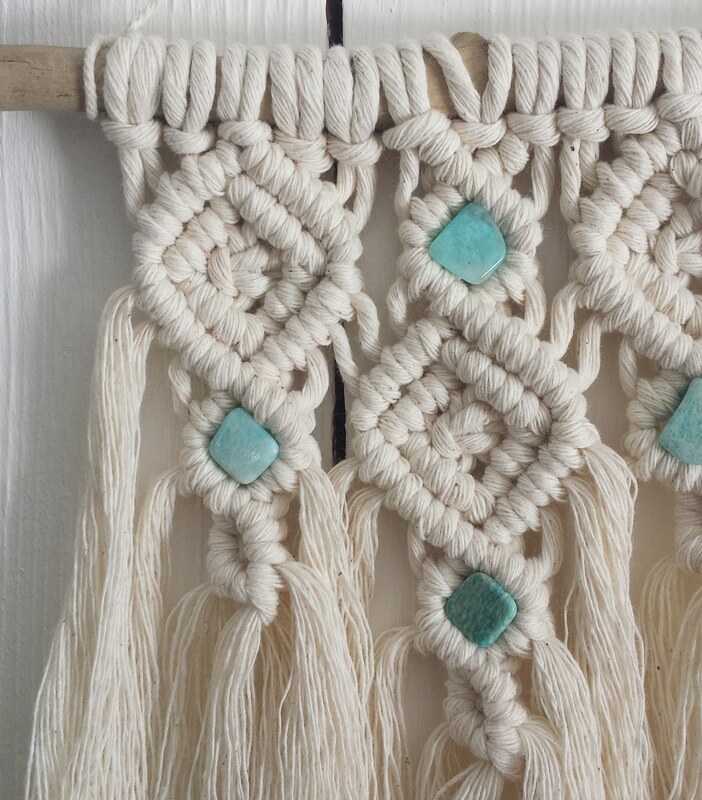 My eyes spotted my Amazonite crystals in my clear plastic organizer just a few seconds before I happened to glance at my macrame piece. Bingo. I’ll be honest: I don’t know what I’m doing. I’m just creating a lot of things because, like every artist, I feel a deep need to do so. I’ll go crazy if I don’t. Now more than ever, I feel it is imperitive that I express outwards, not just in my own safe private spaces. It’s time to release into the world that which comes forth through me. All of this is not just for me, it is meant for others as well. One day I’ll have the means, mentally and physically, to get my music out in the world, and I am working towards that goal with what I have when I have it. In the meantime, I have a blog that I must still write on, and now, artwork created with my own hands that needs to be sent out into the world. I feel a deep conviction that this is something I should do, even when my inner judge says it’s a foolish waste of time and resources. But when I look around my bedroom and see all of these macrame wall-hangings and other art pieces, each with specific stories and meanings, I am reminded again of the power of art, and how art in all it’s varied forms speak of the deeper truths of life. I often work through so much when I am creating, and the final products are a testament to my struggles and my ability to move through and transcend them. When I see them, I am encouraged in my life journey. Each piece carries a specific frequency that I believe has healing potential. I’d like to make this spirit of healing available to others who have open hearts to receive. I know I’m just one artist of millions, but I know my artwork is just as special and important as any other artist’s. There are people out there who will connect with my work, who need it and what it represents. It is my job to make my art available and I have to believe that eventually, these people will find it. I’ll do my best to promote my work, but ultimately I leave it in the hands of The Creator, the Weaver of stories and Source of serendipity. All I can do is obey the artist’s call to create and offer my sacrifice of joy to the world. I know I’m not the only one who needs to meditate on this prayer or Philippians 4:6-8. So let me make it clear for you, in case you didn’t realize it, that this entire blog post and it’s universal lesson was inspired by a bunch of knotted rope. This is what art is for me. When I engage the creative process, my art teaches me and reminds me of exactly what I need, if not in that precise moment then in a future one. All of my wall-hangings have a story, and I look forward to others having these physical stories in their homes and living spaces. 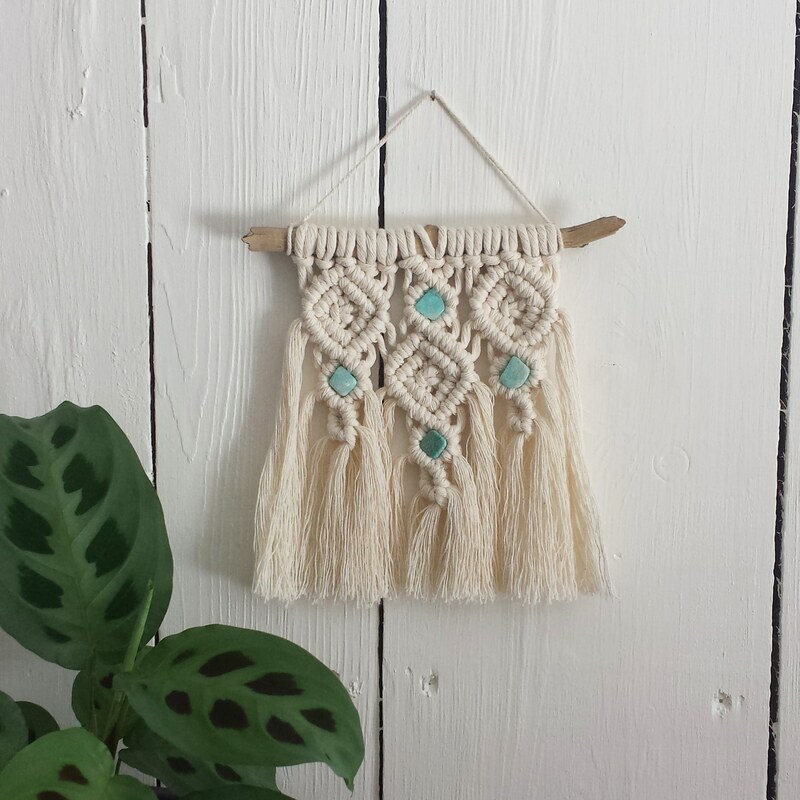 If you’d like to purchase this mini wall hanging, please email me at thegracefulbirch@gmail.com for details.